I started a new job this month, and I honestly expected to be better at handling change by the time I made it (mumble-mumble) years. For the past few years, I've been doing this more often than I'd like: making a move to help my career. I'm always afraid I'm making a colossal mistake. Allllll mistakes are B-I-G in my world, you know? When does it ever get easier? I have the same fluttery uncomfortable feeling I always had when school started again. Would I like my classes? Would I find my classes? Where would I sit in the cafeteria? Where. Is. The. Bathroom? This time, I've left behind really great friends, the kind that text me encouraging words even as they're working double time because they're short handed. And I miss them. The new job is bigger, different, figuring it out is stressful, and that Odd Man Out sensation is so strong. I've been here before, conquered it, and have the friends to prove it, so this too shall pass. I can do this. That thing you're worried about? You can do it, too. I know you can. I hope you have no idea what I'm talking about. Really! I think there are people who are certain of their welcome in every room they enter. If you are one of these lucky souls, don't tell me. I just finished a Christmas story with a hero who I strongly identify with. He stands apart in order to avoid mistakes. 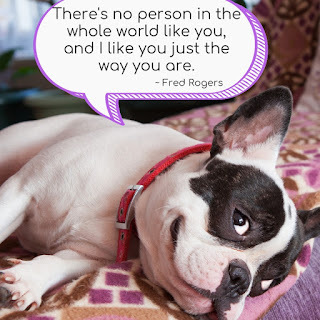 If social anxiety ties you up in knots, know you've got a friend in me and Mr. Rogers and have a little quote with a good dog to start this Monday. Good luck, Cheryl! I've always felt this way, too--I'm pretty sure Mr. Rogers spoke to a lot of us. I have a new boss at work: change. The congregation I attend has a new minister: change. And, I have a 13 year old going through puberty: CHANGE CHANGE CHANGE. I hate change. LOL. How exciting, though, about the new job. Cheryl, Congratulations on your new job! I know you'll be great. And I have every idea of what you're talking about. Lol. I love that you used the phrase, "this too shall pass." It's one of my favorites. And it always does. September, more than any other month, marks change. Congratulations on yours, Cheryl! And I'm sorry it means leaving good friends behind. I always think of Sarah, Plain and Tall: "There is always something to miss, no matter where you are." All the best on your new job and location. I've moved around a lot, and it's always hard to leave friends behind. But I've found the close friendships go the distance. So glad to hear from Mr. Rogers, too. May we all channel Fred Rogers for each other when the going gets tough. A reminder from Mr. Rogers is a great way to start the week, Cheryl! As you say, you’ve done it before and can do it again. That applies not only to new jobs and meeting new people, but to writing,editing, rejections (!!) starting over and so on. Yes. I needed that message today. Thank you and thumbs up for your new beginning! Cheryl, I know you will end up loving your new job and that you will make new friends soon. I was someone who often had to find a new job as my husband was first in military then a telephone engineer and those companies moved him around and up as often as military. Each move I had to find a new job. But I made wonderful friends along the way. Many of whom I still count in that wonderful, lasting friendship category. Looking forward to your latest book. I don't think anyone likes change, even someone like me who rarely feels intimidated about anything--I'm a lot like LeAnn. lol Congrats on your new job and I'm sure you will soon be wondering what you were anxious about! Hang in there, Cheryl! Once you've been there a few weeks you'll be just fine. I'm not great at change, so I know how you feel, but things always work out. Most times better than we expect. 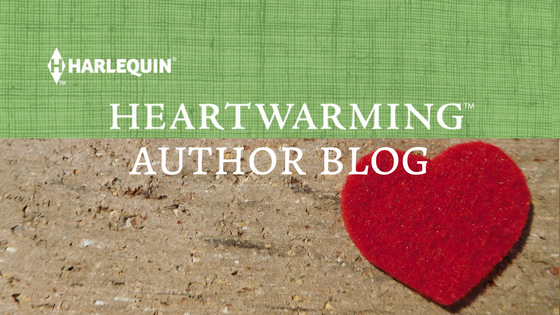 And you know you always have your Harlequin sisters here when you need us! Aw, what a sweet post! You've got this, Cheryl, 100%! :) I'm still trying to work up the courage to watch "Won't You Be my Neighbor" - I'm not ready for the downpour that I know will happen when I watch it. my mom said that my dad actually cried and he never cries! Been there, felt that. Good luck with the new job. Good luck with the new job, Cheryl. I completely relate. But that cute little dog does make it better, and I like you just the way you are, too. Mr. Rogers! What a great mentor to keep in mind whenever we challenge ourselves and step out of the comfort zone. Thank you for reminding us that we can do whatever we set our mind to, and that we're all special! Such a lovely quote. I so relate to your feelings, and I hope you feel more settled soon!